Apparently “the luxury consumer’s desire to climb skyward is most strongly felt in dense, heavily populated urban metropolises”. I can not disagree with that, so when you get the right weather, it’s good to find a venue with a view. Here are a couple of our favourite Roof Top Bars in the urban metropolis that is Barcelona. Drinks are expensive and served in plastic glasses! The staff seem more concerned with keeping the place tidy than serving customers. No idea on the food front as nothing offered on the menu that we could see, just rather plain crisps delivered with our drinks. Views from the Claris Hotel are not as good as the Majestic, but the bar service and food choices are a lot better. It’s a more laid back venue. The prices here are also very expensive so prepare to nurse that drink and make the most of the view. 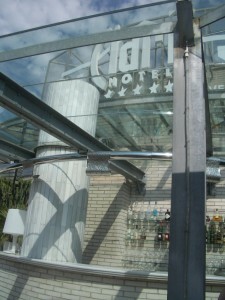 For more roof top bar locations see :- Roof Top Bars in Europe.